Jeff Haywood, CIO, Librarian and Professor at the University of Edinburgh, was featured in last week’s Oct 6th xTalk. 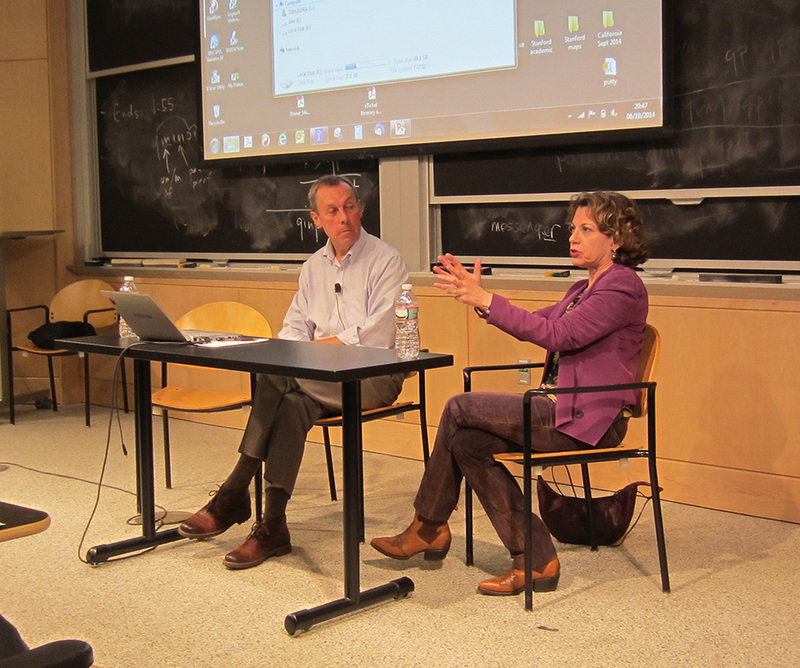 The event was framed around an engaging and informative conversation with Lori Breslow, director of MIT’s Teaching and Learning Lab. The range of topics spanned from online education and MOOCs to team creation models and learning strategies in the digital realm. Most MOOCs at University of Edinburgh are in the humanities and social sciences, representing a very different profile of online courses compared to those offered at MITx. Instead of focusing on comprehension of concepts and determining right or wrong answers, the focus is on discussion, writing, and debate. 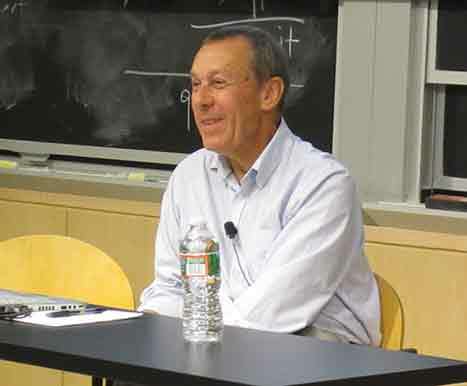 Online learning environments at University of Edinburgh encourage participation as an important element of learning, but Haywood also pointed out that students who are observing are learning, too. Haywood shared the collaborative process used to create and build MOOCs at University of Edinburgh: a community of practice is fostered through the integration of Information Technology, eLearning and Library services into one unit. This organizational strategy has broken down silos and created common ground among faculty, instructional designers, videographers, developers, and others involved in the process. The motivation for creating MOOCs at University of Edinburgh was not remuneration or student recruitment. It was to learn about learning. MOOCs are the changing face of education, and a harbinger of the pedagogy of the future. Happily, because there is so much interest in this area, Haywood’s team has received a number of grants as a consequence of their MOOCs. A typical University of Edinburgh MOOC is 5-7 weeks long, and it is not necessarily derived from or related to an on-campus course but represents something new and unique. Many incoming undergraduates have already taken a MOOC. To further promote student engagement in online learning University of Edinburgh is moving towards to goal of requiring all BA candidates to take at least one online course or MOOC before they graduate. The rationale for this is to prepare students for lifelong education: students should be able to know how to function online as the education of the future will be increasingly in this realm. Haywood mentioned the opportunity of using MOOCs to orient and prepare incoming students prior to arriving on campus. MOOCs could be an effective vehicle to offer induction information to new students. This is particularly relevant at Edinburgh where 40% of the students come outside the UK, and many may be unfamiliar with the UK educational system and/or UK culture. University of Edinburgh has two different tracks for master degrees: online and on campus. The two different tracks serve different populations. Online masters students are almost all working full-time, and going to school part-time. These students may be living very close to campus -- or miles away -- but they are all engaged in part-time learning programs and interact with the University almost entirely online. In contrast, on-campus students are exclusively going to school full-time. Because of this, the on-campus masters program is a more intense commitment, as well as more expensive. The conversation with Haywood and Breslow also touched on areas related to student transcripts and the role of MOOC courses visa-vis on-campus courses, as well as a discussion of the process of quality control that every MOOC undergoes before deployment, and lastly an exploration of the strategic use of faculty input in the time-consuming process of MOOC creation. Haywood mentioned one of University of Edinburgh’s most popular MOOCs was “Equine Nutrition”, a course on the care and feeding of horses. 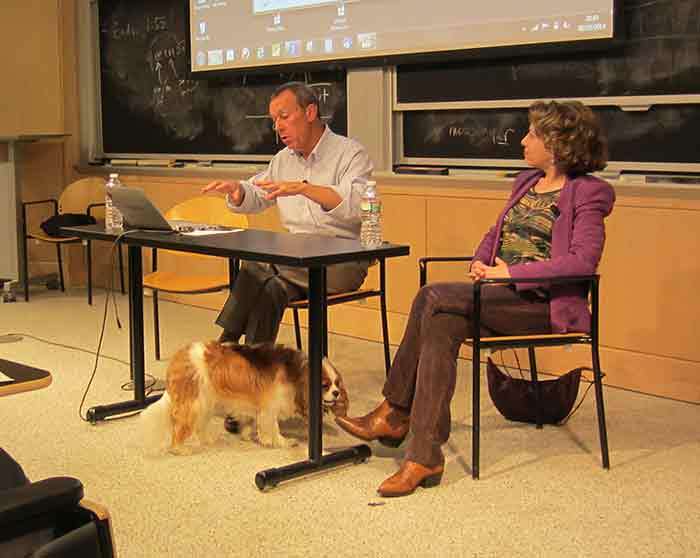 While the audience reflected on this information, a friendly and curious dog wandered on stage, perhaps interested in equine health or simply hoping for the chance of a biscuit or a pat from Breslow or Haywood. It was revealed later that Henry Shelton-Lee is a King Charles Cavalier Spaniel and a well-educated representative of his species, capable of holding his own in any MIT classroom.